Stand-alone Stereo Music Player with MP3 Playback and MP3 to USB/SD Recording, featuring 3-speed (33/45/78rpm) pro deck turntable with flip-over stylus and a 45rpm spindle adaptor. MP3 recording, encoding from Phono to a USB device or SD card (none supplied) and copying from USB to SD, and vice versa, to manage an MP3 collection and all forms of music-playing media. 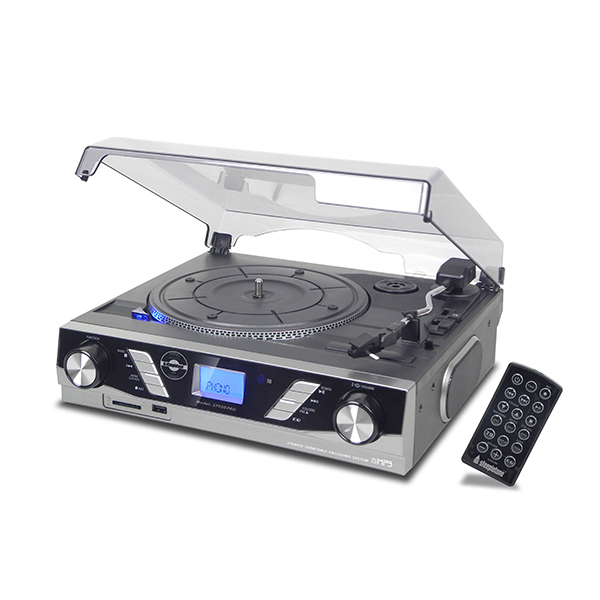 It has an attractive blue LCD display and large rotary control for volume control and power. This superb system is available with either a black or silver front, and comes with a grey perspex dust cover to keep in tiptop condition. It also works easily via remote control.